Use half of a ball (see instructions on how to cut it at bottom) to remove a warm lightbulb from its socket. Speed up the drying time of bulky bedding by tossing a couple of tennis balls in the load. Cut small slits into two balls. Fill with pennies or sand, then seal with tape or superglue. Take the weights on your next power walk. Roll sore feet over tennis balls for a soothing massage. Conquer lids by using the rubber lining of a cut ball to aid your grip. Cut a slit in a tennis ball, then place valuables (jewelry, cash, etc.) inside. Just keep it far away from Fido. Cut an X into four balls and slip the feet of an ironing board inside. Lie down. 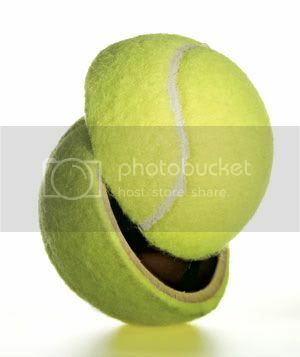 Place a tied sock containing two balls under the spot where your head and neck meet. Tuck your chin and gently nod your head up and down.